On Friday, November 15, 2012, the Bureau of Engraving and Printing (BEP) added uniquely serialized $1 notes to its line of lucky money products. 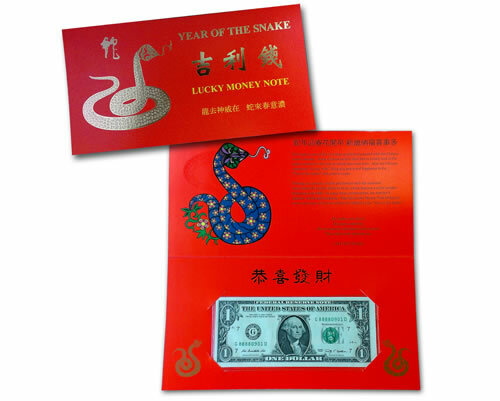 To celebrate the Year of the Snake, crisp uncirculated $1 notes have been produced with serial numbers beginning with "8888". Each dollar bill is held within a red folder with gold foil that is decorated with Chinese symbolism. In the Chinese Lunar calendar, anyone born between the upcoming Chinese New Year of February 10, 2013 and the end of that 12-month calendar on January 30, 2014 is said to be born in the "Year of the Snake." Previous starting years include 2001, 1989, 1977, 1965, 1953, 1941, 1929, 1917 and 1905. Pricing for the Year of the Snake $1 notes is $5.95 for one, down to $4.50 when buying in quantities of 50 to 999, or as low as $3.95 for each when ordering 1,000 or more. Household ordering limits of 1,000 are adhered to until November 23, 2012. Year of the Snake $1 notes have a total product limit of 88,888. In related currency news about money with unique serial numbers, this year is the BEP’s 150th anniversary and it has a product to commemorative it. In joint celebration with the U.S. Mint’s 220th anniversary, the two bureaus created the Making American History Coin and Currency Set. Available for $72.95, each set has a 2012-S Proof American Silver Eagle from the U.S. Mint and a $5 note from the BEP that begins with a serial number of "150." Collectors have purchased 45,430 as of November 12, 2012. The U.S. Mint has indicated the initial production run was for 50,000 sets. The potential maximum limit is 100,000. Read more about the set. BEP facilities in Washington, D.C. and Fort Worth, TX close for the holidays between Monday, December 24 and Tuesday, January 1, 2013. Additionally, the Tour and Visitor Centers for both will close Friday, December 19 — at 3:00 p.m. EST in Washington, D.C. and 5:00 p.m. CST in Fort Worth, TX. They will re-open on January 2, 2013. I might get a MAH set when the final total of SF set is announced. G, Is the snake in the garden or is the garden the problem? Or is it both? Ed, Good one. The joke that keeps on giving.